Demand for fresh cut culinary herbs is increasing in the southern piedmont region of NC. Initial trials show that Oregano can be grown in North Carolina as a commercial culinary herb crop. There are few culinary herb growers in NC. The market has dramatically increased in the past few years and based on trends, will continue to grow. Oreganos hybridize readily, so root division is the most reliable form of propagation. There are several varieties most of which are not suitable for culinary use, so care must be taken initially when selecting plants. Oregano is extremely invasive and must be grown in enclosed area or container. 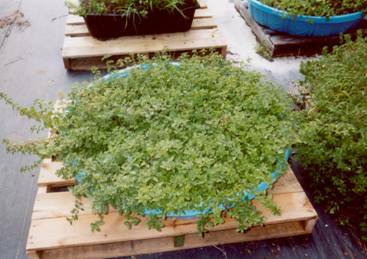 We found that for ease of planting and harvesting, the best containers are five foot diameter kiddie wading pools. Several holes were punched in the bottom of the pool for drainage. The pools were then placed on pallets and filled to depth of six inches with a peat lite potting mix consisting of 55% Canadian Sphagnum Peat, perlite, and vermiculite. Root cuttings were planted on a spacing of five inches on center. Once the plants started to grow, approximately seven days, they were placed on a 30 day fertilizer cycle using a standard 15-30-15 mix. Water was applied as necessary to maintain a moist, but not wet, soil condition. Oregano can be successfully grown in this region of NC.